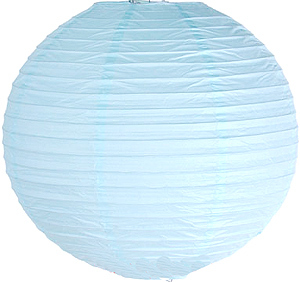 "Sky Blue Round Chinese Paper Lantern"
This is a tradtional powder blue color hanging Chinese paper lantern. We have this lantern in 12,16,18 and 24 inch sizes. It has even bamboo ribbing. This looks very nice when lit. This is a very light "powder" blue color.